Spanish cuisine is fast becoming a popular choice of food provided at parties, functions and events of all varieties. The Valencian rice dish, paella, is one of the most renowned menu offerings that Spanish caterers specialise in. This dish is of signature cultural importance to Spaniards, particularly to those from Valencia, where it originates. Because of its great taste, variety of serving options and inherent suitability for large social events there are multiple providers to choose from. Paella catering prices can vary greatly depending on the amount of servings, size of servings and overall service by the chefs provided. The following will detail some of the most important factors to consider when choosing a business to deliver catering of this marvellous dish. This dish is by its nature highly versatile, being able to be mixed and matched to provide a wide variety of serving options. In order to best serve the greatest range of guests it’s important to make sure that the provider chosen can meet everyone’s personal tastes and dietary demands. Some people love seafood, other hate it. Some people love meat, others are vegetarians. Paella can be served in a way to cater to all of these tastes and preferences so it’s best to go with a service that understands this so that they incorporate it into their menu. What Serving Sizes Do They Provide? This rice dish is designed to be shared by groups of people where it is cooked and served on one large pan. The sizes of serving pan can vary from 55cm to a massive 1.3 metres. 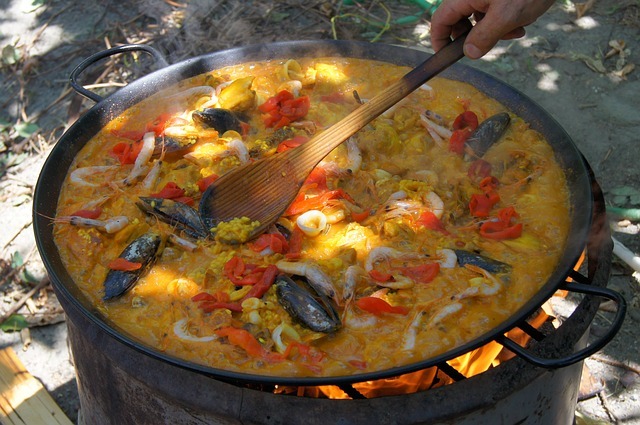 Paella catering prices will be different according to what size of pan and how many of them are required. If an event has upwards of 150 people attending multiple 1.3 metre pans will be required to adequately feed everyone. Serving this dish is different to other catering options because it involves the chefs interacting with guests as they cook the food in front of them. This is one of the main draws of using this dish at social events and if a provider does not offer it then it’s easy to rule them out. Reviews and testimonials are a good place to start when evaluating the type of social experience the chefs will provide at the event. The chefs are essentially doubling as entertainers who can facilitate social interaction and build up the vibe of the party. For this reason it’s important to make sure the right choice is made to maximise the success of serving this dish. If there are any extra services like providing beverages and styling the table layouts then it’s worth looking in to. These small considerations can make the process of planning an event easier when the service can be relied on to take care of more than one thing. Comparing paella catering prices involves more than just looking at the core value of providing the dish itself. As a complete catering experience, the other factors involved in serving this dish need to be considered so that the absolute best choice is made to guarantee a memorable event.